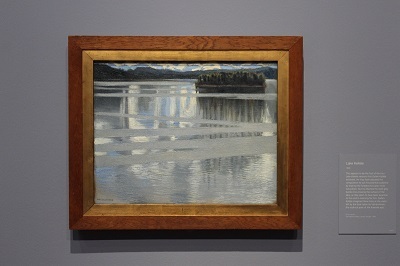 The National Gallery presents Lake Keitele: A Vision of Finland which explores a selection of paintings by the Finnish artist Akseli Gallen-Kallela (1865–1931). This will be the first exhibition in the UK devoted to this artist whose work Lake Keitele (1905) is one of the Gallery’s most popular works. The painting was purchased by the National Gallery in 1999 and it quickly entranced visitors with its unusual impressionistic style. This exhibition provides an in-depth study of the work by bring together all four versions of Gallen-Kallela’s Lake Keitele composition for the first time in the UK. 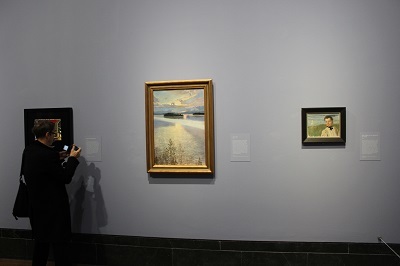 Two Lake Keitele landscapes have been borrowed from private collections, one of which is on long-term loan to the Gallen-Kallela Museum, near Helsinki; the third comes from the Lahti Art Museum/Viipuri Foundation, Finland. Many of the works on display have rarely been exhibited publicly. Lake Keitele: A Vision of Finland is a deceptively simple image: a view of a lake bathed in brilliant light, however the different aspects of landscapes on display show how the artist moved from a more naturalistic landscape to a more impressionistic and abstracted image. Although largely unknown in the UK, Gallen-Kallela is considered one of Finland’s most prominent artists, whose paintings came to embody the country’s cultural nationalism at a time that Finland struggled for political autonomy. Gallen-Kallela trained as an artist in Helsinki and Paris and had a great deal of success in the salons and exhibition rooms of Europe. However, Gallen-Kallela also drew on the ancient legends of his Finnish homeland with a number of representations from the Kalevala, the Finnish national epic of poems glorifying the country’s heroic past. The exhibition which spans 30 years of Gallen-Kallela’s career features a dozen works, including four versions of Lake Keitele. A group of his earlier landscape works, a rare, early stained-glass artwork of a lakeshore view by Gallen-Kallela (1896). Other paintings of lakeside landscapes executed in the summer of 1904 on the shores of Lake Keitele provide evidence of the hold this particular landscape had on the artist. There are also two works on themes from the Kalevala illustrating how the artist brings together his own particular style to the myths and legends of Finland. This fascinating small free exhibition introduces the work of Finnish artist Akseli Gallen-Kallela to a wider audience. 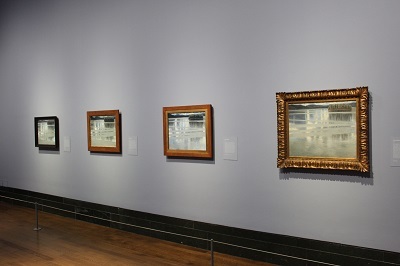 The success of the Lake Keitele (1905) at the National Gallery has created considerable interest in the artist and this exhibition provides some interesting background to the artist and the painting. The exhibition goes some way to explain the painting’s remarkable success beyond its attractive appearance; the artist somehow manages to incorporate many layers of meaning to the work which seem to strike a chord with large numbers of visitors. Perhaps one of the ways this is achieved is by drawing on some of the myths and legends of Finland and finding a way to incorporate them into a typical Finnish landscape. By londonvisitors2014 in Exhibitions on November 14, 2017 .